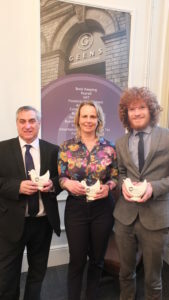 Geens’ Directors Carl France, Karen Lowe and Chris Beeston with the three DMH awards. Geens Chartered Accountants has won a hat trick of accolades for its support for the Douglas Macmillan Hospice. The Stoke-based accountants were the only business to be recognised in the three major categories in the hospice’s 2018 Corporate Awards. Staff at Geens are keen fundraisers – raising over £50,000 for various charities through a programme of sporting challenges – and also support their local hospice by providing audit work at a special charity rate. Director, Carl France said: “As a firm, we believe we have a responsibility to support the community where we can and we are keen to help both the Douglas Macmillan Hospice and the Donna Louise, our local children’s hospice. The Geens’ Challenge team raised more than £7,000 for the Douglas Macmillan Hospice by competing in a gruelling Snowdonia triathlon, which saw them cycle across mountainous terrain, scale Snowdon and canoe across a mountain lake. Other challenges, for a range of charities, have included the Potteries Marathon and a Lake District ultra-event, involving cycling, hiking, canoeing, abseiling and even a cliff jump, over a stamina-sapping 12-hour event. The Blurton-based Douglas Macmillan Hospice presented Geens with the Milestone Award for contributions totalling over £100,000. The company was recognised as a Platinum Partner by the hospice and also won the Supplier Excellence Award. Suzi Smith, Head of Corporate Fundraising and Events, at the Blurton-based Douglas Macmillan Hospice, said: “We are truly grateful to Geens for their continued support of the hospice. The Corporate Awards are just a small way for the hospice to show how much we appreciate the support of businesses as well as highlighting the many ways that they can support the hospice in future. For media enquiries contact Nigel Howle on 07762043436, email nigel.howle@howlecom.co.uk.